...and what an amazing audio book it is! 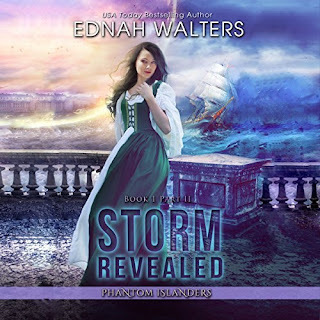 Do you remember the Phantom Islanders series by Ednah Walters? These wonderful books are now available on audio and -wow, they are so amazing! "Because of Him" by Terri E. Laine and Ednah's wonderful story - this is a must have! Nanny to a wealthy family, 18-year old Alexandria "Lexi" Greendale sends most of what she earns home to support her disabled brother. She is determined to help him get the surgery he needs to walk again. Her dreams come to an abrupt halt when she rescues a man from drowning. How does he repay her? 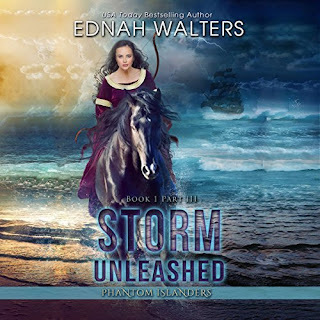 Captain Storm Orath abducts her, claims her as his chosen mate, and takes her to a magical island that is centuries behind times with barbaric customs. Lexi is determined to escape; Storm will do anything to keep her. For Lexi to make it home to her family, she must fight the lure of the man and the island he controls, or stay trapped forever. Are they fated to be together? Will Lexi make it home in time to help her brother? This fast-paced tale is magical, complicated, beautiful, and mysterious. Warning! Once you start this audiobook, you will not be able to stop it until you reach the final minute. This is part one of a three-part upper YA and new adult serial about a woman and her journey of discovery, adventure, and an unforgettable love. 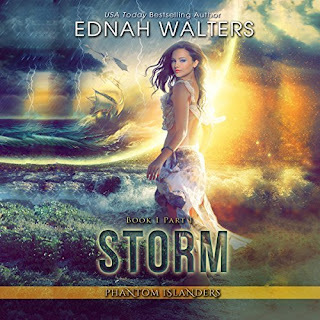 ©2017 Ednah Walters (P)2018 Audible, Inc.
Lexi resigns herself to the primitive living and the strange customs of the islands but struggles with the fact that she will never see or help her brother again. As the people embrace her as Storm's chosen mate, Lexi slowly begins to see the magic around her. When she discovers the truth about Storm and his people, she finally understands why he abducted her and why he needs her to stay. Lexi's feelings for Storm start to change, she accepts the fact that she is Storm's lass and stops trying to escape. But a happy ending will have to wait. Storm has an evil twin and he will use anything and everything to get what he wants. He threatens to destroy the island and its people. Left with no choice, Lexi makes the ultimate sacrifice. This is part two of a three-part upper YA and new adult serial about a woman and her journey of discovery, adventure, and an unforgettable love. The magical world Lexi has come to know isn't done with her yet, and she must discover the lengths she and Storm will go to prove their love and claim each other. Lexi has been kidnapped and transported to HyBrazil, where Storm's evil brother reigns. He plans to make her his mate after he forces her to change. He has her locked in the tower until he breaks her. But Lexi never gives up and is always looking for a way to get back to Storm. Lexi thinks Storm is alive, but she isn't sure. She makes a few friends, but she is always waiting for Tully to grab her. The Oracle has been doing something very dangerous to the old woman in the next cell. Who is she? And why has she been sequestered to the tower? Action dominates the end of this three-part adventure and romance series, along with some huge reveals. Set aside some time after listening to the first two books in the series. You won't be able to pause the last installment! This is part III of a three-part upper YA and new adult serial about a woman and her journey of discovery, adventure, and an unforgettable love.